Ask Amanda: Which side of my knitting is the right side? Remember what it was like before you learned how to read? Every time I wanted to know what something said, I’d have to ask my mom or dad. Letters looked like weird scribbles, and I was always in awe of older kids and their almost magical ability to decipher writing. In the same way learning to read opened up a whole new world when we were young, learning to “read” your knitting can bring a new level of understanding to your projects. Instead of letters and words, a knitter can learn to recognize the loop of each stitch and the shape of each row. Once you’ve started to identify these shapes, you can look at your knitting and see exactly what’s happening, and you’ll be able to notice and correct mistakes quicker. One of the first steps in learning to read your knitting is being able to tell the difference between the right and wrong sides. Right side in knitting patterns is often abbreviated as RS, while wrong side is written as WS. The right side of your knitting is the face of the fabric. This is the side that will be on the outside of a garment. The wrong side is the back side of the fabric, and will be on the inside of a garment. When the right side of the fabric is facing you, you’re working on a right side row. When the wrong side of the fabric is facing you, you’re working on a wrong side row. Stockinette is a great fabric for learning right and wrong sides, as well as the difference between knitting and purling. The “v” shapes created on the right side of stockinette are the knit stitches. The curvy bump shapes on the wrong side are purl stitches. On stranded stockinette, the right and wrong sides are even clearer. The floats between colors are always held to the back, creating a very distinctive wrong side. Ribbing is basically small alternating vertical panels of stockinette. On the right side, the center rib is worked in purl stitches, which naturally recede. On the wrong side, the center rib is worked in knit stitches, which pop forward. Garter stitch results in a reversible fabric – both sides look exactly the same. 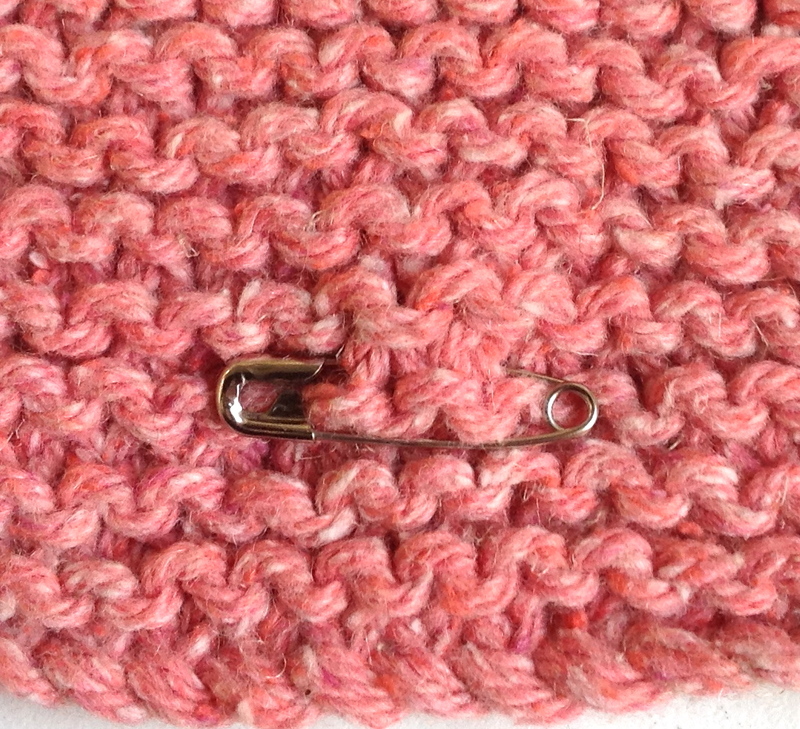 A helpful trick when you’re using a stitch pattern with identical right and wrong sides is to use a safety pin to mark the right side. Every time you see that safety pin, you know it’s time to work a right side row. Identifying the right and wrong sides of your fabric is an important part of mastering knitting basics. With practice, you’ll be able to see everything that’s happening in your project and have a greater understanding of the craft! I was just wondering this. Thanks! Thanks for the lucid explanation of ‘right’ and ‘wrong’ side while knitting. The use of pictures has made it even easier to understand. Thanks for such a great blog post! It’s so hard for new knitters to recognize the difference between the stitches – this is such a great visual! It depends on the cast on, no? Long tail v. Backwards loop or knitted cast on? Which cast-on I choose often depends on which side is right or wrong, and so which side of the cast-on I want to show. I generally use the tail from cast on as a reference as to the correct side. Most projects I find start rs, so the tail is always on the right side of my work. Especially when knitting garter. Thanks for the tip, Danielle! I think my reply ended up in the wrong spot! Hi Jodi – that’s true, it does depend on the cast on. Good point! I think I’m missing something here. The ribbing above looks the same to me in both pictures. Would you please clarify? Hi Jane – the ribbing looks very similar on either side (it is a reversible fabric, so both sides look nice). In the photos of my swatch, if you look at the very center column of the RS, the column is made of purl stitches. In the center column of the WS, the column is made of knit stitches. That’s the only difference – all the stitches that are knits on the RS will be purls on the WS. I hope this clarifies! Amanda, I watch your wonderful illustrations you have on Berroco’s website and I keep all of them in a special folder. It is good to visually see how stitches are made because I sometimes forget. Thanks Regina – I’m so glad they’ve been helpful! Hang on – garter stitch is not COMPLETELY reversible. At the bottom, the first row after being cast on, starts with a line and a space across on one side.There is no line on the other side, it immediately starts into the garter stitch shape. I cannot remember which side is the right side and which is the wrong side, despite your labelling above. Thanks for mentioning, Janey – it’s true, there will either be a ridge of purl bumps or a space of knit stitches directly after the cast on. Since each side looks almost identical, I always end up using a safety pin to mark my RS! Knitting Bernart “My favorite blue/white blanket” and I don’t know once I get into the repetion rows if I knit the right side only or not. i get wrong side of stockinette stitch, I did’nt find to do the right side. when it looks purl, i know this is wrong, could you tell me how? when you do stockinette stitch, you just complete row one with knit and row two with purl? is this is right? reply me, thanks! That’s correct. In stockinette stitch, row 1 is knit, row 2 is purl. but do you know why i get the wrong side of stockinette? how do i get the right side? in my knit project, both of side is purl, is something wrong? With practice it all begins to make sense. For a stockinette stitch you knit 1 row purl 2nd row and repeat. To make a garter stitch you knit each row. Thankyou very much for this advice and the clear pictures. I have searched around on the Internet looking for answer for the question but this is the only one that has really made me understand and helped me with my knitting project. Thank you! I am so glad this helped Hannah! Ok. I understand the difference between the right and wrong side, but what does it mean to knit on the right or wrong side? If I had to cast on twenty stitches and knit ten rows isn’t whether I’m knitting on the right or wrong side determined by what number row I’m on? Help! I see why you might get confused, since whether you are knitting or purling, you are “knitting” (as opposed to crocheting or tatting…). However, if Berroco instructions say to knit 10 rows, you should take it very literally. You perform theknit stitch for 10 rows.The result is called garter stitch. If you are supposed to knit on the RS and purl on the WS, we call that stockinette stitch (st st). If I use long tail cast on in a stockinette pattern, my first row is the purl row – right? I read it’s because the cast on row is counted as the knit row. I’m using a mohair blend yarn so I just don’t see the stitches in v’s and curvy bumps. I’m knitting on the side that curled on the end… which “feels” like it should be called the wrong side. I have no one to ask and I’ve got 74″ to go! Sure hoping I’m okay with this. Sometimes your pattern will specify whether you will be knitting or purling on your wrong side row. However, usually with a long tail cast on I purl the first row and consider it my wrong side. Then I knit the second row to create a stockinette fabric. I hope this helps! This was a perfect explanation. I could tell what was the right side, but I couldn’t figure out that “working a RS row” meant the RS was facing you. Thanks! These are good tips, but keep in mind that rs and ws are just terms and you should be flexible in your work. How you turn your work is usually a preference and you should stay open to new creative possibilities when you’re knitting. Making gauges is a great way to test out new patterns, yarns and ideas. Am afraid I cant see the difference between right side and wrong side of the ribbing pictures. Same for my own knitting here ! Both sides of ribbing will look the same but will raise or sink in opposite places. So if you know the right side started with a knit stitch, you can look for the side that starts with raised stitches. In this case, the wrong side would start with sunken stitches. Hope this helps! I am knitting a baby’s outfit and am up to making the pants my instruction says that I need to finish with a wrong side row. Does this mean that when I continue do I have the right side facing or the wrong side to commence the next lot of pattern which is all in garter stitch? From what you’ve described, you finish the previous section with the wrong side row. When you start the garter stitch section, you will be knitting and facing the right side. Hope this helps! i understand the difference between right and wrong side but the pattern that I’m doing at the moment, I think (if I have translated it correctly), is asking me to knit wrong side half way through a row..? Sorry for not responding sooner. This designer is no longer with the company so we never got a notification. For future reference, you can contact patternsupport@berroco.com for help with specific patterns. Do you know how to back out of a row of knitting when the pattern is alternating K1, K1 in the row below? Row 1: K1, *K the next st in the row below, K1, repeat from * across row. Row 2: K2, *K the next stitch in the row below, K1, repeat from * across row, ending K2 instead of K1. This idiotically simple procedure creates a lovely, cushy Shaker rib, but I cannot for the life of me figure out how to back it out and recover my stitches if I make a mistake. I got distracted while working on the first piece and did Row 1 twice. The person from whom I bought the yarn can’t figure it out, nor can two of my super-knitter friends. Could you help, perchance? You can contact patternsupport@berroco.com for help with specific pattern questions. When doing a cable pattern, the actual cable shows on the purl side, right ? Or did i start on wrong side ? Am i doing right ?! That is common with cables, but it really depends on the pattern. If you have a specific pattern question you can contact patternsupport@berroco.com. I hope I’m posting this in the right place! When looking at my knit fabric, I’m learning to tell the RS from the WS, but I’m having trouble figuring it out when using a pattern. My current proj. pattern (knit flat) has me knitting for 60 rows, then start a new section as follows: “Row 1 (of new section, actually row 61) (RS): knit, Row 2 (of new section, actually row 62) (WS): purl” . . . I have 60 rows of garter st, and on the 61st row, I’m to be on the RS and knit across then on row 62, I’m to be on the WS and purl across. I’m not sure how to tell if I’m on the RS when I get to row 61. Generally speaking, is the right side the odd-numbered rows? So in this example, I finished row 60 (an even numbered row) and as I turn the work and START row 61, that row (61) is facing me and is the right side? And after that knit row, I turn the work and START row 62, that row is now facing me and is the wrong side? I note it is a purl row which you describe as often being the wrong side. Am I doing this right? I think I need to place a locking stitch marker on the right side. As I’m knitting that first section of 60 knit rows which side is the right side? Would it be the side with the odd numbered rows? i.e. after I knit row 5 and before I turn the work, I could put a marker on to indicate that is the right side? Please email patternsupport@berroco.com with specific pattern questions. I am knitting a poncho for my granddaughter. My next row reads k5, which I have done, then it reads turn work. Pattern also says on short rows worked without wrapping to reveal eyelet. I was wanting to go ahead today, but question what to do. The difference between right and wrong side for new knitters out there! Thank-you, was feeling like an idiot. Right side is facing you while knitting a right side row. I know it seems obvious but this fact had my head in a spin trying to confirm it. Starting with garter stich, have to then increase on the wrong side, then start a cable & the front side had to be known (leave @front of work). Thanks again..Kathy. If I’m doing a k1, p1 rib for a split hem at the bottom of a sweater, is the first row that I work after casting on with long tail method considered the right side? Thanks! That will depend on your pattern—many times the pattern will state that the first row is the RS or WS. If it doesn’t initially state it, generally if you start k1, p1, and end with a k1, that’s the RS; if you start p1, k1, and end with a p1, that would usually be the WS. Hi Amanda, I am working in garter stitch am i can not figure out what side is the right side. As Amanda wrote at the end of her blog post, when you need to determine the right side and wrong side in garter stitch, it’s helpful to put a removable marker or a safety pin on the right side of the work—that way as you’re flipping the work back to front, you constantly have a visual reminder of which side is the right side. Hi Anne, Which pattern are you looking at? Usually it will say (RS) or (WS) somewhere in the pattern which side is intended to be the right side.